problem-based learning | Another dot in the blogosphere? Like newspapers and magazines, libraries need to stay ahead of the curve in their bid to stay relevant. Thanks to Carolyn, my regular provider of news tidbits, I gained an insight from the Rambling Librarian about the Republic Polytechnic Library right here in Singapore. It’s no New York Public Library (see a photo I took of its Reading Room about three years ago), but it is quite impressive in its own right. I include one of the Rambling Librarian’s photos below thanks to the Creative Commons license. I am not just referring to its spaciousness or its modern look and feel. It seems to have been designed and built with the polytechnic’s problem-based learning approach in mind. 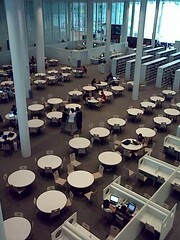 There is space and seating for small teams to gather, discuss, research and play. Speaking of play, there are areas for gaming as well! I have not personally been to that library, but I’d like to visit it some day to get an up close and personal feel of it. I’d also like to gauge if its used the way its been design to.